TSS PRO 700CS is a remarkable, breakthrough silicone sealant: (1) it stops discoloring from ugly algae, mold and fungi (“microorganisms”) on brick, masonry, stucco, grout, concrete, stone, vinyl, tile, plaster, roofs, wood and drywall for years, (2) it retards fire from spreading on combustible surfaces and (3) it prevents water entry – it is salt water proof. NOTICE: This product is VOC Compliant and available to consumers in AZ (Maricopa County), CA, CT, DE, IL, IN, MA, MD, ME, NH, NJ, NY, OH, PA, RI, VA (Northern), VT, Washington, D.C., and Canada. Consumers in these regions can NOT purchase 1-gallon and/or 5-gallon bottles of this product. ClearSurface has undergone extensive antimicrobial and mold testing. ClearSurface is extremely effective on ugly black and brown discoloring, the most commonly found issues particularly on limestone, however it may or may not be effective on some strains of green algae. ClearSurface molecularly bonds to a substrate forming a seamless, durable barrier. Once cured the surface is harmless to humans and pets. TSSPRO 700CS seals and prevents black algae growth on outdoor surfaces by blocking out water and food access. 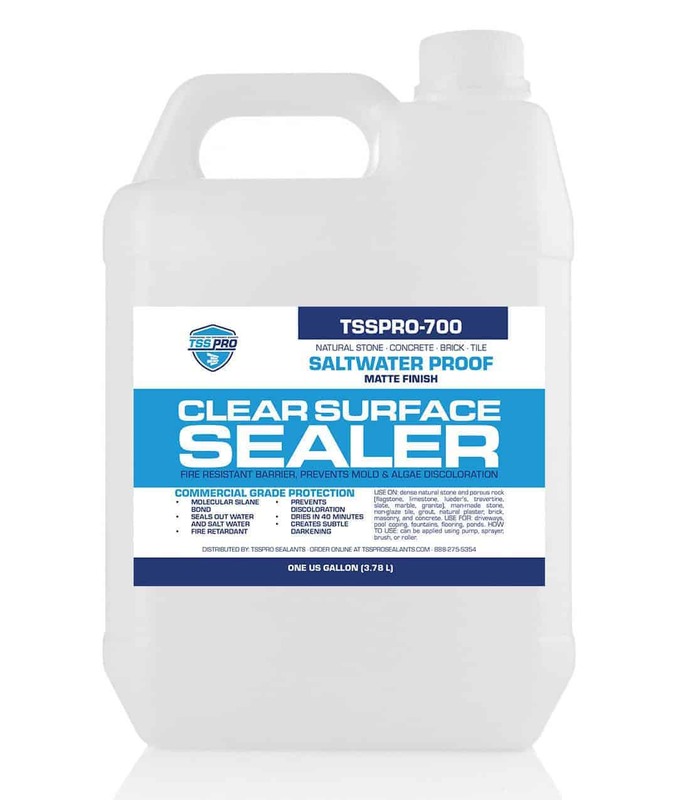 Ideal as an outdoor limestone sealer, TSSPRO 700 also protects against black mold and mildew on other hard surfaces such as concrete driveways, retaining walls, and brick on the exterior of homes. This stone and concrete sealant keeps surfaces looking clean and new for years! Our 700CS sealant is a solvent-borne silane, considered a VOC. Sealants made from solvent-borne silanes offer the best protecting against water, sealing out moisture with an impenetrable barrier of sealant. The silicon polymer prevents water impregnation in hard surfaces that can cause black algae. Initially the formula was intended specifically for sealing limestone, because limestone is tricky type of stone to seal because of it is so porous, needs a lot of oxygen, and other complicating matters. After feedback from adventurous customers and our own testing we?re recommending it for many other surfaces as well. What Can I Seal With the 700CS CLEARSURFACE Sealant? Use TSSPRO 700CS to seal pool copings, the area surrounding a pool. This formula seals out water completely and is saltwater proof and chlorine proof: ideal for sealing pool decks and around hot tubs.